Here is my race report from the Ken Woods Memorial Road Race last weekend. I had better results this time around, but still have a lot of room for improvement. That being said, I think I am getting more comfortable with the pack and getting a read on what is going on to race smarter and stronger than I have in the past. Anyways, enjoy the report. Summary and reference links are at the bottom. This was a 42 mile race, that consisted of 2 laps around a 21 mile course. The south section of course was extremely rough with many holes in the ashpalt and a pretty rough ride. There were quite a few rolling hills and a nice climb to the lap finish line. Lap 1 was pretty lively for knowing we had a second lap of 21 miles to go. I tried to to sit in as much as I could, but it was like a slinky on every hill and turn and I felt like I was either tapping the brakes or on the gas most of the time. There was one guy that was all over the road and I just couldn’t get away from him. This guy would swerve back and forth by at least 2 bike lanes, making anybody behind or beside him put in a lot of work to avoid a wreck. I did whatever I could to get away from this guy or out in front of him, but he just seemed to be everywhere… literally. We hit some high speeds on one of the decents in the back half of the course and were strung out, but then I think everybody got back together again. Things became even more lively after that and we went up one of the intermediate hills/climbs pretty fast. It appeared that the group might actually split and I put in a fairly hard effort up the hill to pull around anybody that was struggling and get near the front. At this point, a large enough group of strong riders would probably be able to hang on to a break away. Especially since we were soon approaching the bigger climb at the lap start/finish line. I don’t know that anything was going to happen on purpose, but folks were struggling on the hills and I didn’t want to get caught behind them. When it came to the big climb at the end of the lap, it felt like things stayed fairly undercontrol. I kept myself in a safe spot to avoid getting dropped in a split of the peloton and then sat in for most of the climb. I think we did string out a little bit near the end of it, but most riders came back together in the group. As we got into lap 2, I put a lot more effort into keeping myself near the front of the pack or at least in the front 15 or 20. The first portion of the lap felt fairly tame if I remember correctly. As we got about halfway around the course, it was really difficult to hold a position near the front. There was a lot of manuevering going on and riders could get real pushy about positioning. I sat up in the 4th or 5th spot back for a short period and then kept finding myself either getting pushed out or sucked back as another line of riders would push forward and people would jump between lines. As we got further around the back half of the course, I got more aggressive about holding a position near the front, even if it meant hanging out in the wind. There were quite a few rollers, a long downhill and then an intermediate climb that I wanted to make sure I was near the front, in case of a split. A split of a few strong riders at this point, would definitely hold to the finish line. I spent quite a bit of time hanging out in the wind, about 5 or 6 riders back over the last few miles, before the final turn. I can’t remember exactly how it happened, but I got sucked back big time as we made the final turn. I think another line or 2 of riders was making a run on the front as we approached the turn. I didn’t panic and stayed calm, but I knew I had the legs to hold my own up at the front of the climb. Nobody was breaking away yet, but I was probably sitting 20+ back in the pack now, that was starting to spread across the road and I made a break for it. I had to dodge in and out of holes, but made my way through to the top 12 to 15. By this time, things were starting to spread out in front of me and catching the lead guys was not going to happen. I stayed on the gas and worked by a few more racers as we crested the first portion of the climb and then was probably sitting about 10 back now. I reeled in 1 guy on the flat, but got passed immediatly after by somebody that was on my wheel that I didn’t realize was there. 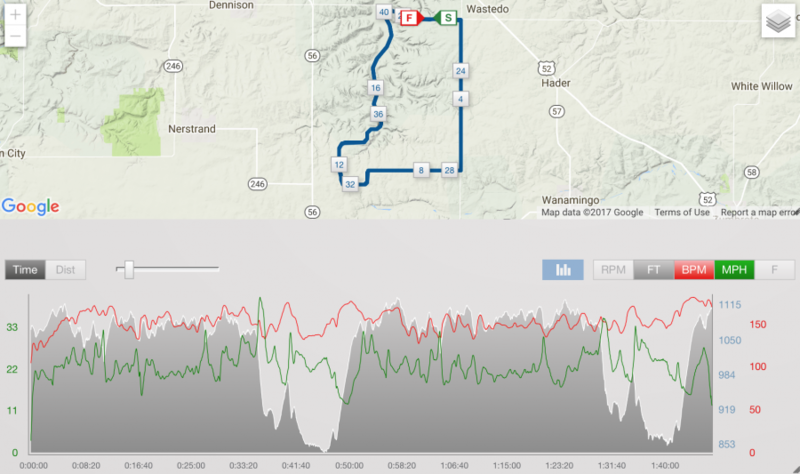 We hit the last portion of hill before the finish and I reeled him back in and shot past another that was fading quick. My legs were not done yet and I stayed on the gas as there were 1 or 2 more in range, but I ran out of road as we hit the finish line. I ended up crossing the finish in 8th place out of 52 in the field. This was my best road race finish yet and I feel like I am starting a get a lot more comfortable riding in the packs. I still could have put myself in a better position as we approached that final turn to the climb, but I did a better job this time around vs the previous race. I should have jumped a little sooner and might have been able to get to the front before the front guys really started pulling away. I felt like I was still pulling strong all the way through the finish line and could have went for another lap. I have some work to do in figuring out how to hold my place in line without getting pushed out in the wind and sucked back, but I’m getting better. I’m also getting better at being able to read what’s going on around me in the pack, so I can better react or plan my next move. I don’t think there are any road races in the next couple of months that I can make it too, but I am looking at a few in July. I enjoyed the Ken Woods Memorial race as I think I am just getting more comfortable with the wheel to wheel riding. Anyways, at this point… I plan to keep some road racing in the schedule, so look for a couple more to come later in the year. Urland Lutheran Church – Thanks to these folks for opening up their property for parking and hosting the race.